Driver vs. Driver is a unique golf reality TV series produced by Wilson Golf and The Golf Channel, and each broadcast episode will be available to watch in the UK & Ireland. The seven-episode second series will be uploaded to DriverVsDriver.com on Wednesday morning (3 October) and every subsequent week, with the show concluding on Wednesday, 14 November. 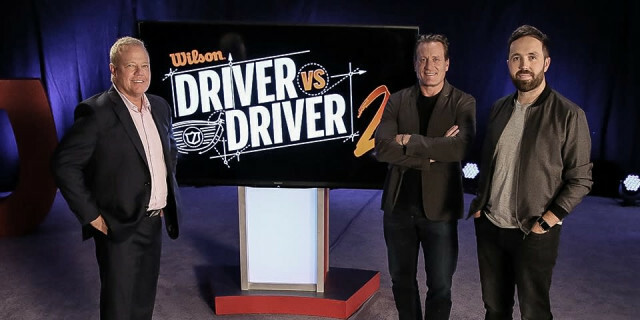 The winner will be awarded a grand prize of $250,000 in cash and a Wilson Staff driver inspired by their concept hitting retail stores worldwide just after the show has aired. Fourteen finalists will present their innovative driver concepts with the hopes of ultimately becoming Wilson Golf’s next world-class driver. This follows the launch of the Wilson Staff Triton, designed by Eric Sillies, an industrial design graduate from the University of Cincinnati, who was crowned the winner of Driver vs. Driver’s Series One in 2016. UK and Ireland viewers will have a familiar face on the judging panel this time around. Rick Shiels, a PGA Professional, expert golf equipment reviewer and online golf personality who has nearly 400,000 subscribers and more than 120 million views on his YouTube Channel, joins Wilson Golf President Tim Clarke and NHL Legend and Avid Golfer Jeremy Roenick in the hotseats. “I’ve loved every minute of working with Wilson Golf and the Golf Channel on Driver vs Driver 2,” said Rick, who uses the Wilson Staff FG Tour V6 irons away from the camera. “Being a judge on a show like this was a great opportunity for me as equipment design is something I’m really passionate about. I’ve hit loads of shots during the filming process and it’s been great hearing the thought processes behind the drivers from some very interesting characters. “I hope that sharing my ideas and philosophies with them has helped create a driver that will have a big impact on the market,” he added. The finalists’ concepts will be field tested, critiqued and refined during the series by some of the game’s best players on the PGA TOUR. Plus, celebrities from the field of sports and entertainment; golf industry experts; members of the national golf and sports media; bloggers; and social media influencers. “Golfers are passionate about their golf clubs and Driver vs. Driver 2 takes viewers behind the curtain on the design process and ultimately introduces them to Wilson Golf’s newest driver,” said Keith Allo, Golf Channel Vice President of Original Productions. “The uniqueness of this series allows us to introduce viewers to great personalities and showcase the tension and drama of this competition, with the winning driver concept hitting stores worldwide soon after the final episode,” he added. “The show, from its inception, was designed to utilise the power of crowd-sourcing combined with Wilson LABS’ (the innovation hub at Wilson) deep golf experience and expertise to create a world-class golf driver in a way that had never been done before,” said Clarke, who has been the Wilson Golf President for 12 years. “Driver vs. Driver was also created to infuse new energy and excitement into the golf equipment conversation, open the game of golf to a broader audience and bring highly innovative products to the marketplace,” he added. For more details on the show, visit www.drivervsdriver.com and for further information on all Wilson Staff products, including woods, wedges, putters, balls and accessories go to www.wilson.com. Twist Face Tech - McIlory, Day, Johnson, Rose and Rahm Amazed!